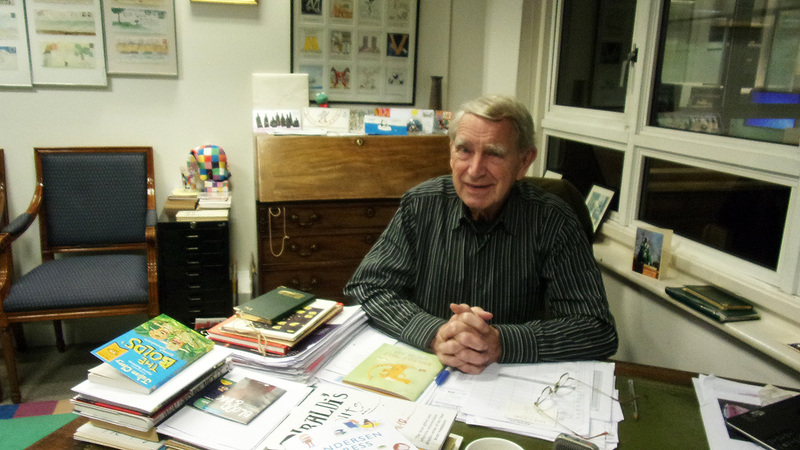 Klaus Flugge’s office at Andersen Press is packed with books and illustrations, and includes the type of furniture rarely seen in a modern publisher’s – a wooden desk with a leather top and a writing table in the corner with a fold up lid. They add a cosy feel to the glass fronted office overlooking Pimlico near the Thames. 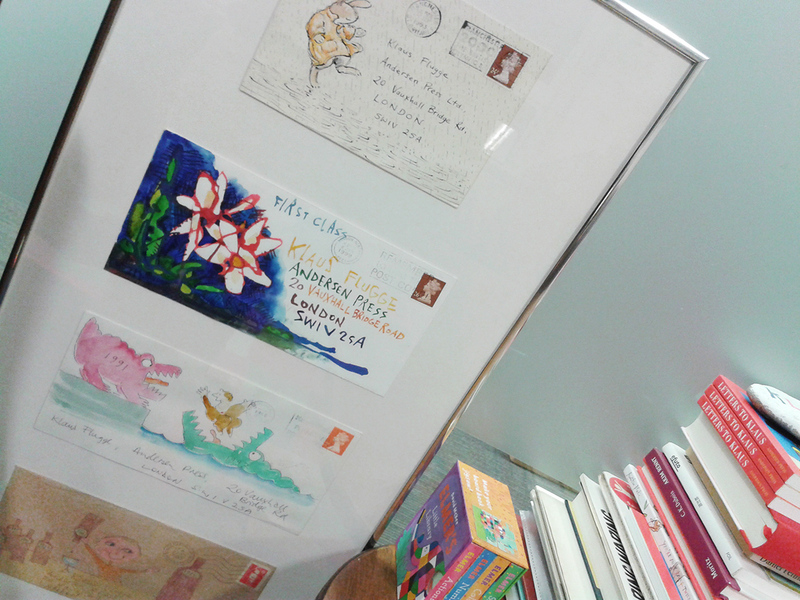 Artwork from Letters to Klaus (below) are framed on the wall; envelope art complied into a publication which supports Save the Children created by many of Andresen Press’ well know artists, Satoshi Kitamura, David McKee, Susan Varley, Tony Ross and others. We talk about many of the distinguished authors and illustrators he’s worked with over the years, including Ralph Steadman, Michael Foreman, Quentin Blake and Leo Lionni -“something to be proud of, I guess” – and look over some of McKee’s Elmer books, which have been a long-term success for the publishing house. 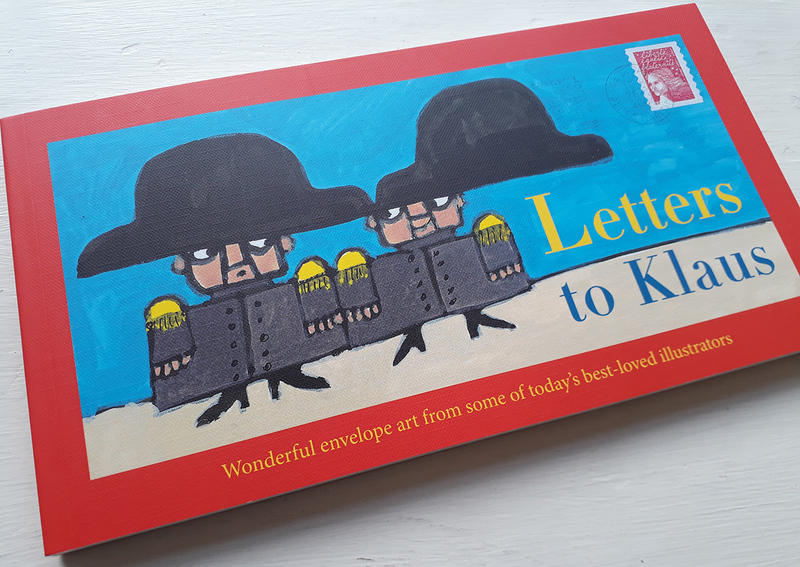 This nurturing of picture book talent has been a constant in Klaus’ career, with the Klaus Flugge Prize being a recent highly supportive action. 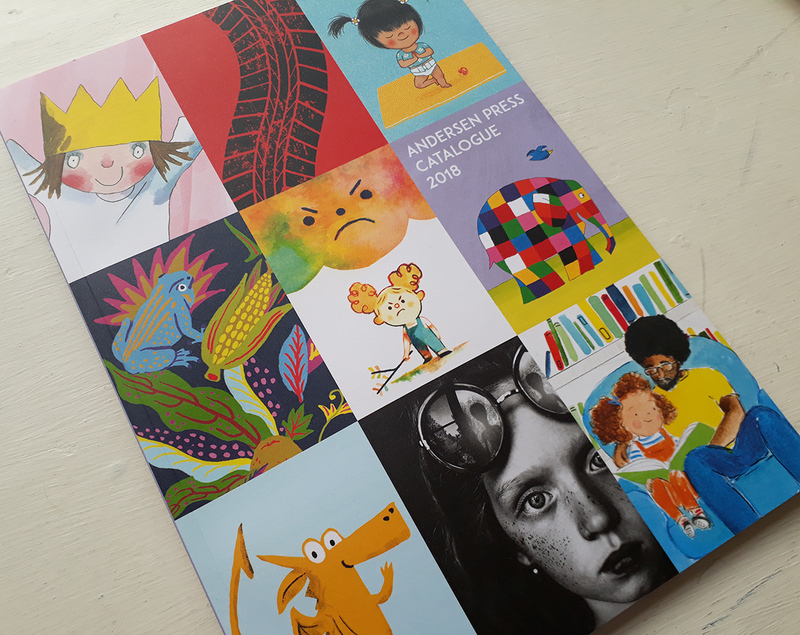 UK Publishers enter books from their lists, with the Prize ‘awarded to the most promising and exciting newcomer to children’s book illustration’. The Jury for the Prize maintains distinguished participants including chair Julia Eccleshare, Axel Scheffler, Nicolette Jones and Professor Martin Salisbury – and this year includes Children’s Laureate, Lauren Child. Although Klaus had modestly felt he couldn’t call his publishing house after himself (it was finally named after Hans Andersen – “I was conscious that a lot of British people preferred home-grown names, ones they could pronounce”) it made sense that the Prize was called after its founder. “Everyone said, ‘Oh, call it the Klaus Flugge Prize’, and it was my own personal money I put in there, so why not?” The generous sum of £5000 for the winning book has been gratefully received by the recipients, “It goes to artists who have just started and don’t make much money – it comes in handy”, and as charitable status could not be achieved the money remains a personal contribution. 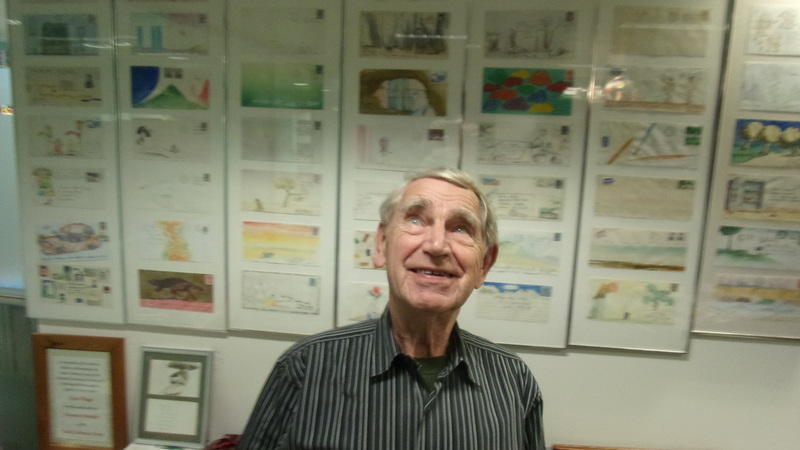 When creating the Prize, Klaus and his team were aware that two previous awards for picture books, the Kurt Maschler Award and Mother Goose Award no longer existed (both ended in 1999), and there was the Macmillan prize for unpublished picture books running, but no prize for the best picture book of the year, “So we settled on that.” Although Klaus believes they would probably have gone for an unpublished award if that had not already been in place. 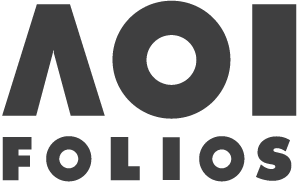 The Prize builds on a tradition which benefits the children’s publishing world, bringing attention to this area which helps artists and publishers. It’s fantastic to have a first book published, but further publicity for a book can only be a good thing, helping to keep on-going focus on the publication. And prizes are excellent for that. Klaus started his own company in 1976, in a relatively small way, but accurately states “The quality of books I’ve published over the years has been bloody good!” Not just because of many of his popular illustrator writers but because it’s sustained by Tony Ross and Quentin Blake and the incredible success of David McKee’s Elmer, which makes up 20% of the publisher’s sales – partly due to merchandising from the books. McKee has been with Klaus since before Andersen was started. We talk about longevity of careers, and how even successful illustrators’ stars can wane over time, or how a single character can maintain it’s creator’s success. And the importantance of participation in promotion from the creators: Klaus notes that “Editors look at how much authors and illustrators are prepared to promote their books”. Also the quality of books and how picture books are tackling interesting topics, such as last year’s Prize winner, The Journey by Francesca Sanna. 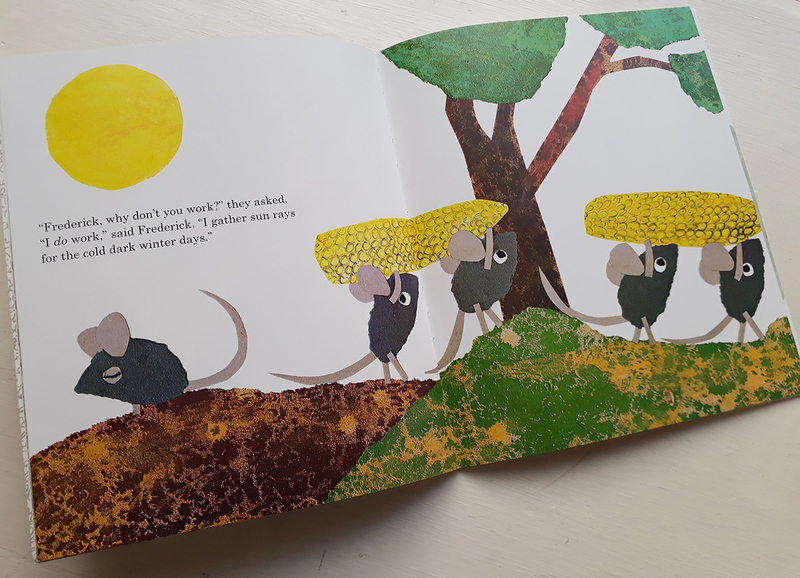 Keen to give new life to picture books published in the past, Klaus has been reissuing or publishing works for the first time in the UK, including Frederick by Leo Lionni, initially published in the late 1960’s but looking completely contemporary with it’s collaged images. 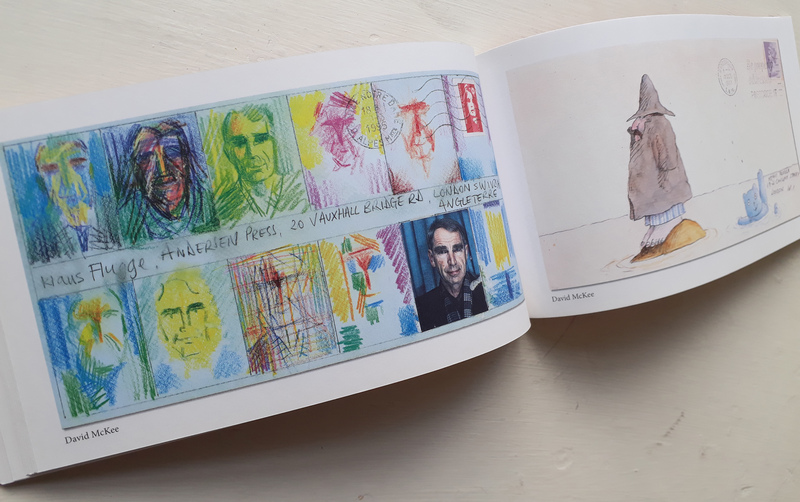 Andersen have also republished about ten of Quentin Blake’s books, emphasising their contribution to the continuing success of the picture book, alongside the positive recognition brought to new picture book creators through the Klaus Flugge Prize. See the Prize 2018 Longlist here.